PS: There are exceptions, always. Depression ‘makes our vision fade to grey. The world literally fades to grey when we feel depressed, scientists have discovered. Depression has an effect on the eyes that makes it harder to detect the black and white contrasts. The retina, at the back of the eye, contains the sensitive cells that turn light signals into nerve messages, making it possible to see. Depressed patients were found to have dramatically lower retinal contrast ‘gain’ than the volunteers who were not suffering from depression. It made no difference whether or not they were receiving antidepressant medication. There was also a significant correlation between the level of contrast gain and symptom severity. Patients with the most depression had the lowest retinal responses. The pattern was so consistent it was possible to distinguish highly depressed patients from healthy volunteers simply by looking at the test results. The most popular filter for those who are depressed is ‘Inkwell’- which color photos black and white. 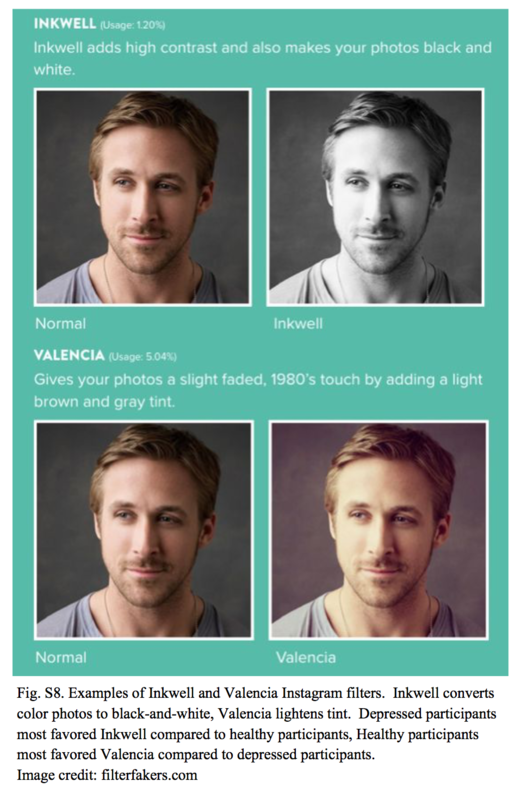 Whereas, “healthy” participants preferred ‘Valencia’- which lightens the tint of photos. (The below pictorial representation of Filter Usage by participants who are depressed vs. those who are not, is striking 😱). 7 Rare Mental Disorders that will leave you thankful for your brain!